Our many days off with fat full purses. To do that though we must be brave. From Betty to George and John to Joe. It’s not easy what we do everyday. Not a break do we get if something’s astray. Its with each morning we trudge this winding warpath. We bravely enjoy this work in our hearts. Like a pig in the mud, I just might start squealing! Or crappy assignments from crap to gold I spin. And I will into the workforce crossover. My disposition will be so much brighter and sunny. Swallowing healthy bowels in large stride. It smells like 10 rats dead in a bag. And try not to look seasick like on a boat. And I simply smile and try to converse. Factor VIII to X like a great romance. Good thing your body has them all. It’s the toughest subject in all the land. Our brain will be full like we drank four kegs. Soon you’ll see reason and not be averse. With it’s knowledge you’ll keep your license blackless. Please, Tie the Restrains Right! You know, on the guy that ain’t acting like a jolly saint? and has blood flowing out like the river Rhine. What the heck!? How hard is it tying ONE knot? Its just a loop with a loose end that plops. And now I have to deal with this rift! Man! Were you raised by wolves? Your clothes and hair are full of weevils. To get you clean we’d need a loofah made of cactus. Hopefully you don’t plug up any drain troughs. Keep it contained, don’t let it spread. It makes me hate Milk of Magnesia. I’d much rather before a drug test, smoke pot. Definitely not for men who want good female relations. Or tying your shoes for hours and hours. Or trying to convince OJ’s grand jury. Or doing jumping jacks near open wires. Or running naked in a cold dark blizzard. Tired of yelling and crying with yelps. Tired of acting always like saints. Tired of making decisions from a fog. Otherwise we may all turn into a lynch mob. 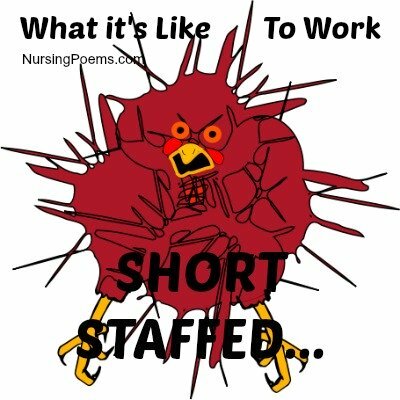 Please give us better staffing!!! About this I am surely not laughing.